Among many of its current products, Monitor Audio is showing its latest Silver series of speakers at the 2014 CES. Uniting Monitor Audio’s latest engineering with beautifully slender design in a wide range of real wood and high gloss piano finishes, the newest Silver evolution offers an exceptional balance of performance, versatility, lifestyle appeal and value. With the success of the RX speaker series as its blueprint, the latest Silver range advances the art of midmarket speaker development with new models and technologies. Features introduced by the brand’s prestigious Platinum and Gold series speakers have been refined, and recent innovations in driver engineering incorporated across an extended new Silver series, which includes two stand mount models: Silver 1 and 2; three floor-standing speakers: Silver 6, 8, 10; a dedicated center, an ‘FX’ surround speaker and active subwoofer.. 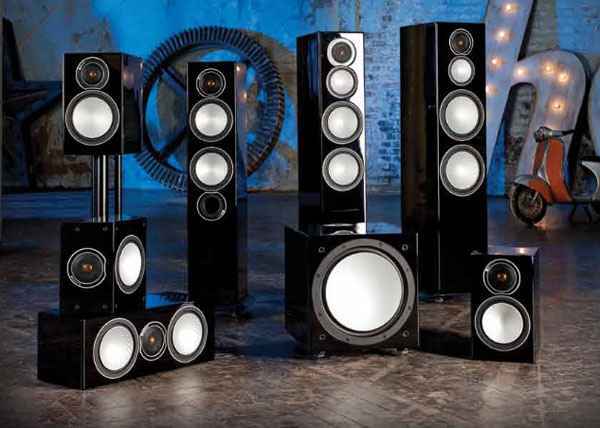 While Silver 1, 2, 6, center and FX retain the form factor of their predecessors, the Silver 8 becomes a full three way design, and new to the Silver family, the Silver 10 tower offers an up-scaled floor-standing format, featuring twin 8” bass drivers for a deeper more dynamic and consistent response in larger rooms. Available in a choice of premium quality real wood Rosenut, Walnut and Black Oak veneers, together with high-gloss black and white finishes, the new Silver series sets an elevated standard of excellence in music and film systems for the home. CANADA HiFi recently reviewed the Silver 8 floorstanding speaker from this new series – to read the review, please click here. Unlike conventional cones, which incorporate a center aperture for the voice-coil, the dimpled RST (Rigid Surface Technology) C-CAM cones deployed by the Silver series take the form of a continuous uninterrupted radiating dish having inherently greater strength and area. The voice coil sits beneath and is coupled to a larger motor by an innovative, more efficient drive assembly. Extensive research and FEA modelling have helped us to determine the ideal mechanical relationships required to increase excursion and power handling while reducing distortion for a more dynamic and accurate response. In addition, the Silver 8 and 10 models feature a newly developed 4” mid-range driver, operating in its own damped and optimised enclosure to provide accurate mid frequencies. It features a short voice coil ‘under-hung’ in relation to the magnetic gap to ensure that the coil remains inside the gap at all times for significantly reduced modulation and extremely low distortion. Distortion from air compression at the back of a tweeter dome has been eliminated by Silver’s new 1″ C-CAM tweeter design, which vents internally around the outside of the magnet system into a large rear-loading chamber, producing much lower resonance and better overall damping. The frequency response from the new tweeter is more accurate at lower frequencies for a smoother more natural handover with the mid/bass driver. Meanwhile high frequency extension has been improved and break-up reduced by improvements in cone geometry and drive mechanism. The new Silver series retains the single bolt-through driver fixings deployed by RX to reduce cabinet colouration. Each bolt acts as a rigid brace, but also removes the need for conventional driver fixings as well, effectively decoupling the driver and front baffle to eliminate a further source of resonance. The absence of conventional driver fixings contributes to a cleaner more elegant appearance – especially in tandem with Silver’s ‘invisible’ magnetic grille location. Evolving from Platinum, Monitor Audio’s HiVe port technology is incorporated on all but Center, FX and W-12 subwoofer models. HiVe uses a straight rifled design to accelerate air flow and reduce turbulence for clean powerful bass and superior transient response. Polypropylene film capacitors, air core and laminated steel core inductors have been utilized in the crossovers to maintain the best possible signal integrity. All models in the new Silver range offer higher sensitivity, reduced distortion and higher impedance than their predecessors, ensuring a wider choice of partnering equipment. Cabinets are of 20mm MDF throughout (25mm for W12 subwoofer) – up from 19mm RX – and in conjunction with bolt-through driver bracing, employ additional radial and cross-bracing for high rigidity and low colouration. All new Silver models are available in a choice of selected premium quality wood veneers or high gloss finishes. The compact new Silver 1 features a single 6” C-CAM bass/mid-range driver featuring dimpled RST cone technology in a classic two-way monitor configuration. High output and dynamic delivery make the Silver 1 an ideal choice for small to medium rooms in two channel stereo or multi-channel cinema systems. The Silver 2 features a powerful 8” C-CAM RST bass/mid driver in a compact two-way stand mount design. Higher overall efficiency and driver size delivers excellent dynamic headroom with the extended bass normally associated with floor-standing models. Exceptional resolution combined with high output and remarkable dynamic delivery mean that the Silver 2 is suitable for mediumto large rooms in two-channel stereo of multi-channel cinema systems. The Silver 6 incorporates a 6” C-CAM RST bass driver and 6” C-CAM RST bass/mid driver in a 2.5 way system configuration. The drivers are housed in separate acoustic chambers within the enclosure design to provide differential tuning for higher efficiency and enhanced low frequency extension. Excellent dynamics combined with a naturally rhythmic sonic character and tight, controlled bass make the Silver 6 and outstanding communicator of music and film audio. The Silver 8 has a new three-way design featuring Silver’s 4” C-CAM RST mid-range driver flanked by long-throw C-CAM RST 6.5” bass drivers. Introduced for Silver, this specialized configuration is optimized for greater accuracy over a critical frequency band to deliver superb midrange focus and precision as well as extended bass. A taller, shallower cabinet and improved damping allows for greater room position flexibility, while higher sensitivity and impedance make the Silver 8 easier to drive for room-filling dynamics, even in larger spaces. Silver 10 is a completely new model introduction, comprising a three-way configuration in a large floor-standing tower system. For Silver 10, the 4” C-CAM RST mid-range driver is flanked by 8” C-CAM RST long-throw bass drivers. The acoustic design is similar to the Silver 8 but the enhanced driver size means that the 10 is equipped to energize the largest of rooms with naturally explicit wideband audio from music and film sources. The compact Silver Center features twin 6” C-CAM RST bass/mid-range drivers in a familiar M-T-M array. The Silver Center has been tuned to match the tonal character of its Silver range mates for a seamless front sound stage in multi-channel applications. The discreetly profiled angled baffle design of the new Silver FX surround speaker incorporates a single front-mounted 6” C-CAM RST bass/mid driver and twin side-mounted C-CAM tweeters. It can be flush-mounted on side or rear walls and its dispersion characteristics changed at the flick of a switch for dipole or bi-pole operation. The new Silver W-12 active subwoofer introduces a number of new design developments housed in a compact high power unit. A new 500 watt DSP controlled amplifier utilizes advanced switch-mode power conversion techniques and superior processing to increase dynamic control and deliver far greater head-room. The W-12’s sealed box construction ensures that this potent unity of power and control delivers tight, fast and tuneful bass all the way down to a thunderous 22Hz in a typical room set up. The sealed box, front-firing driver design makes for easy installation and EQ where close proximity to a room boundary may be necessary. The W-12 also features Monitor Audio’s proprietary and innovative APC (Automatic Position Correction) system, which uses a microphone and test tones to identify detrimental room modes and correct frequency response for the room and position automatically. This simple and quick process will ensure optimized bass quality in any room.